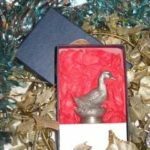 The hand crafted mallard duck bottle stopper in pewter and finished by hand with paint and cork. A gracious glider across the water is our Mallard Duck. Moving across the still lake, mirrored like glass, without a ripple or sound. The shore fades in the distance as grazing landing looms in the distance and tucked in one wing is….a bottle of wine! Feel safe as the Mallard Duck sits upon your bottle and seals in your wine. Its a simple life, going from glass to glass, bottle to bottle yet it suits this duck right down to the ground…or should I say water….no wine. Don’t worry if you’re still unsure. Any questions you may have can be easily answered using the live chat box, by picking up the phone or emailing in and we’ll get on the case for you.